Ever heard of a drumlin swarm? 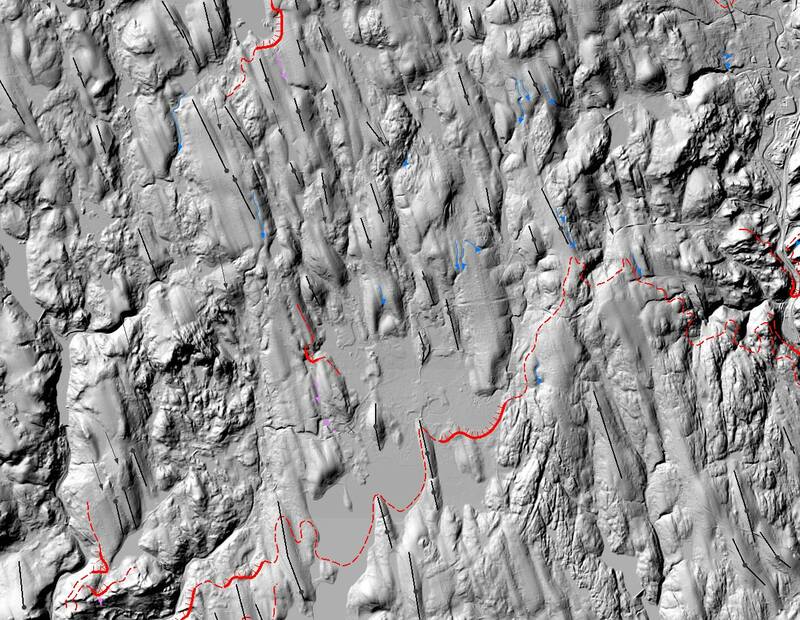 Using LiDAR as a basis for a writing project that in part included landscape geologic analysis, I was scanning NW CT for drumlin swarms today and found this nice aggregation in western Litchfield. The image spans the area from the Shepaug Reservoir to the west to Rt. 8 to the east, with Bantam Lake at bottom center left. LiDAR nicely images the terrain and I added a Quaternary geology layer over it to highlight glacial and post-glacial features. The image is 9 miles wide x 8 miles high. Drumlin axes are depicted by black lines. Black dots are summits. Black lines with arrows are glacial striations cut into bedrock that are visible at those sites. Red lines are glacial ice margins that moved N and S over the life of the glacier. Blue lines are meltwater channels. Pink lines are glacial lake spillways. North is up in this image, and the strike of the glacier is clearly visible running NNW to SSE. Drumlins are teardrop-shaped hills made up of deposits of glacial till, sand, and gravel that were being transported by a moving glacier. They are steep on their north faces and gradual to the south, aligning with glacial flow. Drumlins form as a result of a resistance in the deforming surface of the till or debris material that separates a glacier from solid ground. The glacial system reacts by flowing around these resistances thus forming a dimpled landscape topography similar to the surface of a golf ball, the surface of which promotes a decrease in drag and therefore a higher degree of energetic efficiency. This quest for low-energy movement is duplicated across the landscape. Thus, drumlin formation occurs through a self-organizing process that creates widespread drumlin fields or drumlin swarms that facilitate the flow of the glacier. Remarkable stuff. Areas of undifferentiated deposits lie between the drumlins, and during the early Holocene retreat of the Wisconsin glacier these locales often filled with water forming glacial lakes. When the water finally overtopped the deposit dam, spillways formed that often cut the river and stream features that we see today.